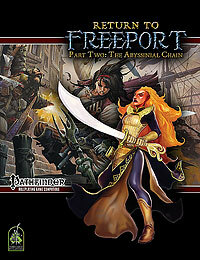 Freeport and Pathfinder fans, it’s time for the second part of Return to Freeport, The Abyssinial Chain. A silent threat grows in Freeport’s streets, even as the city’s newest heroes bring the terror of the Brine Witch to an end. One of the pirate city’s own leaders brings Freeport ever closer to war, lining his traitorous pockets even as he plans to open the city to foreign invasion.